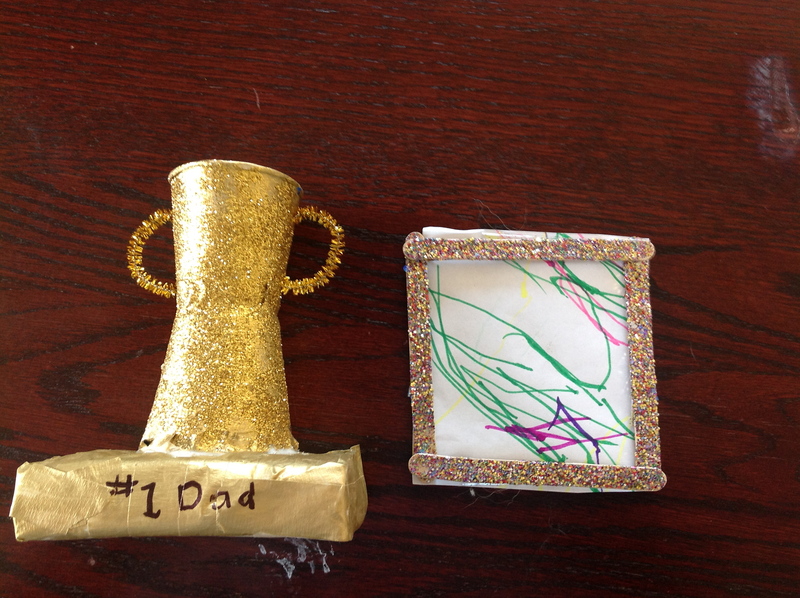 These are Avery’s father’s day and mother’s day gifts from Goddard. I cannot attest to how much he actually had to do with them. Goddard: He got an incident report because he has a bump on his head from, I guess, leaning back in the chair and hitting a shelf. I did feel a bump, but he seems fine. Says he likes music class. When big kids go to camp in 2 weeks, I will spend a day with him. Avery brought home a father’s day gift. I always wonder if and how much they prep these things before-hand. But I think they try to do a lot of stuff like this to sort of maintain a home/school connection. They had muffins and fruit for parents on Mother’s Day weekend. Big kids school was frustrating today. Not sure why. Everyone was just not on their game and was getting frustrated with the work and each other. It kind of feeds off itself. One bad assignment can domino into struggles in everything else. It is the mood of it. Have to see how I can pick it up when that happens. Aaron read “Wild School” and did the worksheet. I put Naim back on Lesson 1 of Discoveries in Early Reading. Calvert Math, did Lesson 5.8 on symmetry. Cut symmetrical shapes out. Aaron-Sylvan 2pp., worksheets for Lesson 13 and reread story in HOP book. BrainPop-was about parallel sentence structure which was a bit over their heads. We’ve been in the habit of watching one a day. Sometimes they are right where the kids are, sometimes below and above. With Avery, went to playground. The plan was bike riding today, but my dad screwed up those bikes so bad they have not worked right since I rode them around in Target. They are only getting worse. I’m going to have to take them to a bike shop to see if they are salvageable. He made me pay for them (I mean, he didn’t make me, he just didn’t offer.) and then he breaks them before the kids even have a chance to use them because he doesn’t listen to instructions and does everything half-assed. The worse part is, they have totally turned the kids off of bike riding because they have had no success with the things. Then my dad busted the big wheel, too, and still didn’t offer to replace it. But, playground was ok. Kids found another older boy to play with while Avery and I diddled around. 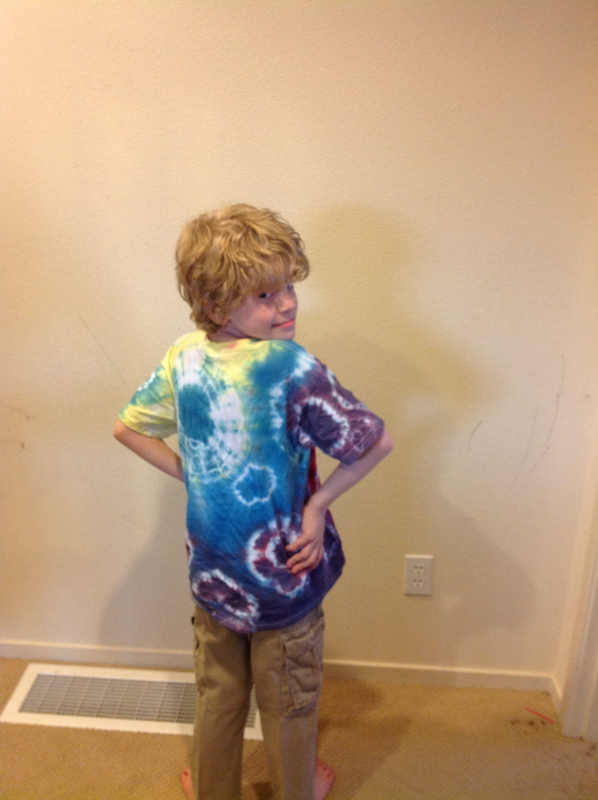 Finished Naim’s tie dye shirt. In the dryer now, will take pics later. Aaron made a wind-up fan with Naim’s snap circuits and made a small demo video. 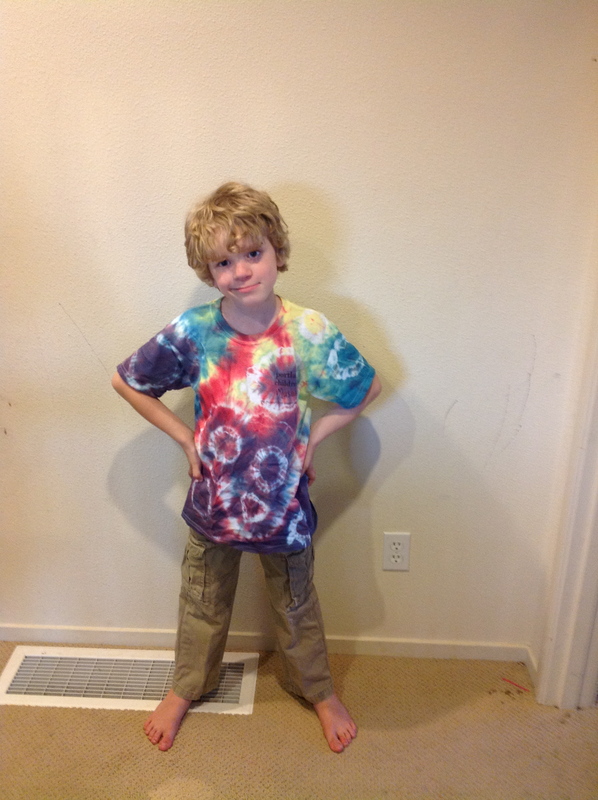 Naim modeling his Tie Dye shirt he made yesterday at PCM. It turned out better than I thought it might. More colorful and interesting. Modeling the back, with a perfect model over-the-shoulder glance.